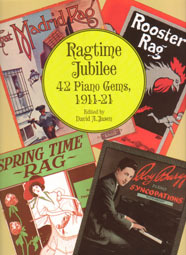 Sheet Music reprints of 42 piano Gems 1911 through 1921. From the back cover: "This is the era where ragtime was coming into full flower. Rhythms became more inventive, textures more interesting, harmonies riches, and glittering key board stylings became the rage of the new decade." PUBLIC DOMAIN STATUS: All selections are reprints of original or early editions with copyright date and publisher shown. The publisher has paid no royalties for the publication of this sheet music and all are believed to be in the public domain in the United States. Public domain status may not apply in countries outside of the United States where copyright protection may exist.